The online version of CCII transports the in-class version of this course into an online setting. The structure of the course's curriculum--its approach to argumentation and research--remains more or less identical to the in-person sections of this course (see CCII Course Overview for more info about the curriculum for CCII); however, there are a number of unique, idiosyncratic features to the online course, which are outlined below. In addition to the information below, before teaching the course for the first time, Rowan Global strongly suggests that each instructor complete a brief online class that explains how online learning is structured at Rowan University and how Canvas works. The course is offered through Rowan Global, which is the entity that manages all online and hybrid courses at Rowan. You can find more information about Rowan Global here: https://rowanu.com/. Because of the course's partnership with Rowan Global, each section has an Instructional Designer. This person will set up and manage your course's Canvas site. Your Instructional Designer will contact you in advance of the semester, to notify you when your course's Canvas site is set up. At any point throughout the course, if you have questions, you can contact your Instructional Designer. The course is run through Canvas, which is the Learning Management System used for all online and hybrid courses. Canvas is similar to Blackboard, in that it is a stable, online environment where resources and materials for the course are available to students and instructors. All interactions that you and your students have with the course will be through your course's Canvas site. Rowan Global seeks to maintain consistency across all sections of a particular course. This is to ensure that students have a similar experience and meet the same learning outcomes across sections. Because of this, all sections of CCII Online are pre-populated with assignment sheets, due dates, discussion board questions, instructional videos, and other course materials that are identical across sections. Therefore, instructors are not required (and are not able) to create or significantly modify the Canvas site for their course. While instructors are wedded to the pre-populated structure of the course, instructors do have control over the "Announcements" section of the course, since this is the one section of the course that is not pre-populated by Rowan Global. The "Announcements" section can be a helpful way to maintain regular contact with students. Also, while instructors have less control over certain elements of the structure of the course (particularly the discussion boards, assignment descriptions, and due dates) announcements are a useful tool for guiding students through the course material and highlighting pertinent information. One of the primary means of student engagement in the course is the discussion board questions (DQs). These are threaded discussions that happen on a more-or-less weekly basis. Students are required to submit their responses by a predetermined deadline each week (usually Friday at 11:59 PM) and then they are required to reply to a classmate's response by another predetermined deadline (usually Monday at 11:59 PM). While students are graded on their responses (and their replies to their classmates) an instructor's role in these DQs is primarily to shepherd students through a meaningful interaction that promotes thinking about the course's goals, not that dissimilar from how a verbal discussion works in an in-person class, so while each student's response will be read and assessed by the instructor, an instructor can selectively provide feedback on the discussion board itself, so as to guide students toward meaningful responses. Peer review on all three major essays is done through a discursive discussion board, where students post their rough drafts and then comment on one classmate's essay. The pedagogical rationale behind this approach is that it shepherds students toward a central location where drafts are shared. 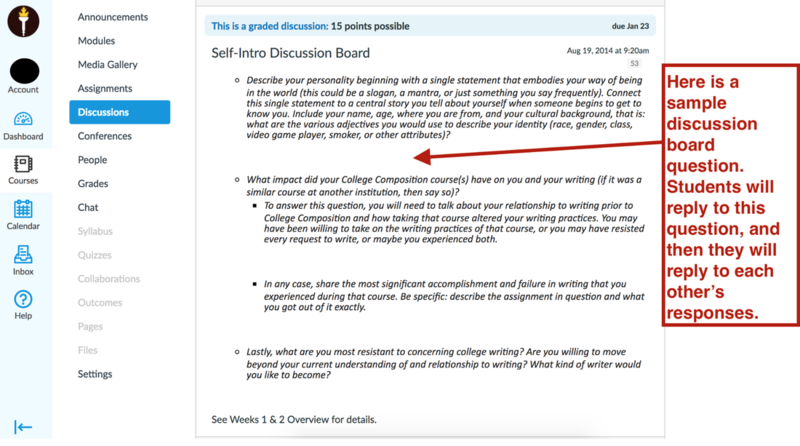 With this approach, while students are only required to give feedback to one of their classmates, the discussion board provides students easy access to the entire class's work so they can read and think through the kinds of informed, rhetorical choices their classmates are making in their essays. To that effect, once each peer review is complete, it might be productive to send out an announcement to students encouraging them to peruse their classmates' work, beyond the one that they already commented on, and to review some of the feedback that their peers are leaving for each other. Through online learning, Rowan Global seeks to open the doors to a population of students who would otherwise struggle to attend Rowan University, primarily students who are geographically far from the university (and thereby couldn't physically attend classes on campus), as well as students whose personal or work schedule would restrict their ability to attend physical classes throughout the school week. Online classes can also be a good fit for "returning" students. Since CCII relies on open discussion of contentious, contemporary issues, it will be useful to be aware of the population of students who tend to take CCII Online. Otherwise, students in CCII online have met the same admission requirements for all other students at the university. ​In any class, students value interaction with their instructors, and students in online classes especially often crave human interaction. Because of the online nature of the class, most students are incapable of attending physical office hours; however, it is recommended that instructors hold virtual office hours on a regular basis so that students who wish to take advantage of them can. While instructors can feel free to use communication platforms that are outside of their course's Canvas site (e.g. Google Hangout, Skype, phone calls, etc.) to make themselves available to students, Canvas does provide a fairly user-friendly "Chat" feature that instructors can use for making themselves available to their students. However, please note: anyone who is logged into the course's "Chat" feature can view any content shared through it, so be mindful of not sharing any confidential information, like grades. Regardless of the manner in which instructors make themselves available, and regardless of whether or not students take advantage of the instructor's virtual office hours, students are vocally appreciative of an instructor's efforts to maintain open channels of communication about the course. In Canvas, the learning management system for online classes, instructors must submit a grade for every assignment; to make this system compatible with our program's emphasis on holistic revision and to encourage students to focus on the feedback they have been given on their work, instructors teaching online CCII are strongly encouraged to assign a pass/fail grade for each essay and in their feedback to the student provide a "projected grade" that indicates roughly where the essay would be if it were submitted in the student's final portfolio. While this projected grade is designed to give students an idea of how much revision will be necessary for their work to be portfolio ready, the focus of the feedback on student work should be on the content of a student's ideas--a practice that is in line with the rest of our FYW program. If you'll be providing feedback to students' essays by annotating them in Canvas, it's recommended that you guide students through how to view your feedback in Canvas. Below, you will find a visual guide that instructs students how to read your comments on their essays in Canvas. You may wish to send this guide to your students after you've left feedback on their first essay. Conferences are built into the course during Week 9 & 10, and students receive a pass/fail grade for DQ 8 for attending their conferences. Instructors can use whatever channel of communication they are most comfortable with for conferences--Google Hangout, Skpe, Canvas's "chat" feature, etc. If an instructor would like to conference with a student beyond the one built-in conference during Week 9 & 10, they can feel free to, but just be aware of the fact that the course prompts (and requires) students to conference with their instructors during Week 9 & 10. While students use an e-book for the course's text book, instructors are still required to order that book through the university's bookstore. The course uses Writing Arguments in the Revel platform (an interactive online text created by Pearson). The ISBN for this book is 9780134192178. Feel free to contact Jude Miller, the CCII Course Coordinator, if you have questions regarding your book order for CCII Online. Use a photo avatar: this can be helpful for your students to feel a human connection to the class. Lesson planning: because of the pre-populated nature of the course, instructors will not need to plan and implement lessons. It is recommended, however, to use time that would otherwise be spent planning lessons on responding to DQs and ensuring that students are keeping up with the course's requirements. It is useful to try to walk through the course from a student's perspective and to keep an eye to the future, by being mindful of what is required of students in the coming weeks.